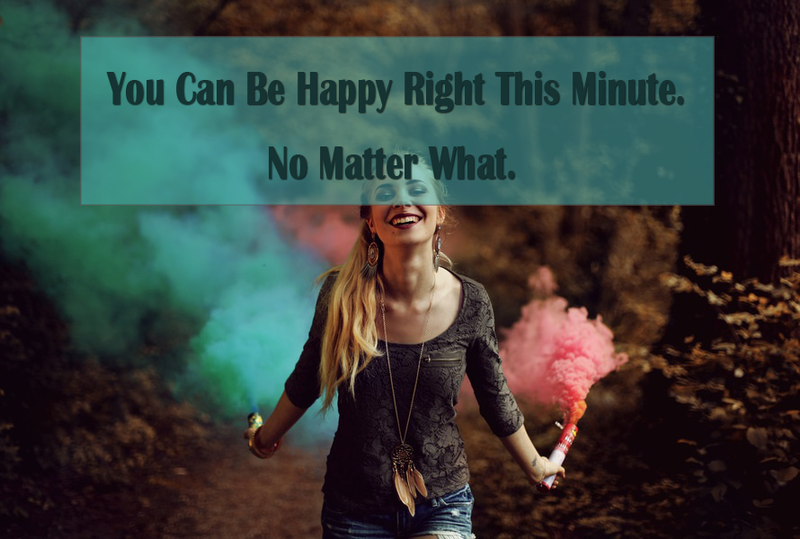 You Can Be Happy Right This Minute, No Matter What - Better Believe It! It’s probably common knowledge that happiness is an inside job. It doesn’t depend on other people, places, events, or circumstances. But I love the idea of how completely within my control my level of happiness is, so I’m going to revisit that topic here today. And sometimes, I need a reminder, especially when things just aren’t going so well on the outside. So maybe this can be a reminder of your immense power, too. 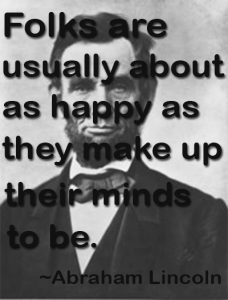 External Events Don’t Make You Unhappy. Your Beliefs Do. But what if your boyfriend dumps you, but you find out that person was actually a psychopath who killed their last three girlfriends. Do you feel sad that you got dumped? No – you feel thrilled. So “getting dumped” is not the important factor here. What changed? Nothing but your beliefs. Say you get fired from your job, but you believe it was a lousy position and you also believe you cann get a better job. How do you feel? 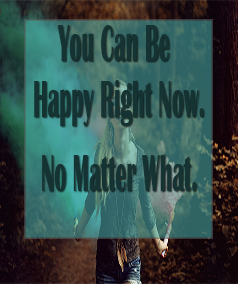 You’re unfazed, and maybe even a bit happy. But what if you believe it was the greatest job ever and you believe you’ll never get another one that good. You’re devastated and depressed. Your emotions aren’t random. They follow from beliefs. There are no good or bad events. There’s only perception. Nothing either good nor bad but thinking makes it so. Sometimes We’re Stuck With Crappy Events. But Happiness Is Still A Choice. Patch Adams is an M.D. whose life was made into the 1998 movie of the same name. After a series of devastating events like the sudden death of his father, then the suicide of his favorite uncle, and finally, getting dumped by his beloved girlfriend, he became suicidal himself. He was admitted to a locked ward at a hospital in Fairfax, Virginia where he stayed for 2 weeks. When he got out, he devoted himself to learning everything he could about love, happiness, friendship, and living a joy-filled life. He practiced friendliness by giving himself personal challenges – like calling 50 numbers in the phone book, and seeing how long he could keep people on the phone. He’d ride elevators to see how many floors it took to get riders introduced and singing songs. After he left the hospital, he decided he wanted to study medicine. However, because of his hospitalization, admission officials decided to delay his admission for 9 months so he could “get himself together”. Patch recalls those days, saying, “Nurtured by levity and love, I blossomed. I defeated all my demons and became the person I am today. My self-confidence, love of wisdom, and desire to change the world were rooted in that brief period, when I climbed out of despair to rebirth”. When you realize that you are in control of your happiness, boredom turns into exploration. Canceled flights turn into a party. Waiting in line becomes a great opportunity to meet new people. Vacuuming the floor is a ballet performed to Van Morrison. A rainy day calls for an indoor picnic with exotic cheeses. 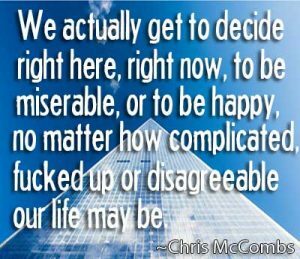 The point is: YOU GET TO CHOOSE!, regardless of the circumstances. Choose happiness. Choose fun. You have the power to do so. Right now. 11 Ways To Make Yourself Happy No, Really. You’re Making It All Up. Change Your Beliefs to Help Yourself Quit Smoking Don’t Just Do. Be.